An artist’s impression of a trio of super-earths. These three represent the planets found around the star HD 40307. The headlines have been coming thick and fast. 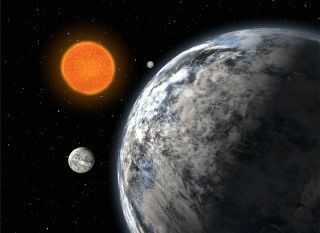 A trio of super-Earths found in the habitable zone of the star Gliese 667C, two probably rocky planets in the Goldilocks zone around Kepler-62 and possible super-Earths orbiting Tau Ceti and HD 40307 at just the right distance for liquid water to exist on their surfaces, albeit under certain conditions. Not yet. Our knowledge of these planets is woefully incomplete. However, the times may be changing. While we cannot yet determine whether a planet is hospitable to life, David Kipping of the Harvard–Smithsonian Center for Astrophysics has led a team of astronomers to develop a new theoretical model that can tell us with one swift glance whether a super-Earth — a world with two to 10 times the mass of our planet and up to twice the diameter — has an atmosphere that might not be suitable for life. Consequently, we could rule such worlds out of our search for analogs to Earth. It’s all about whether a planet has an atmosphere and how that atmosphere is connected to the relationship between a planet’s mass and diameter. The two main exoplanet detecting techniques are beautifully complementary. When a planet transits its star — that is, passes in front of its star, blocking a fraction of the starlight — we can determine the diameter of the planet from the size of the transit. Meanwhile, that orbiting planet also exerts a gravitational tug on its parent star. If we can detect that tug we can calculate the planet’s mass based on the extent by which the planet is pulling on the star. The only problem is that not all planets orbit their star at an appropriate angle for us to see a transit, while some exoplanets and their stars are too distant and faint for us to accurately measure their "radial velocity" tug (many of the Kepler spacecraft’s candidate planets fall into this category). However, for those worlds where we are fortunate to know both properties, we can work out a planet’s volume and then divide the mass by the calculated volume to determine the planet’s density, which tells us whether it is likely rocky, gaseous or icy. The computer model that Kipping has developed, along with Harvard’s Dimitar Sasselov and Princeton’s David Spiegel, allows an astronomer to plug in these numbers for mass and radius and, with the knowledge of the density, figure out if a planet — in particular a super-Earth — has a light but extended atmosphere or a relatively thin, heavy atmosphere. That’s important because Earth’s atmosphere is the latter kind — a 100 kilometer (62 mile) layer filled with the likes of nitrogen, oxygen, carbon dioxide, argon, water vapor and neon that contributes just 1.5 percent of Earth’s radius. We don’t know if an extended atmosphere of mostly hydrogen and helium — similar to Uranus’ or Neptune’s atmospheres but warmer — could support life, and so searches for Earth’s twin may want to avoid such worlds. An artist’s impression of the super-earth GJ 1214b orbiting close to its star. Astronomers have studied its atmosphere with both the Hubble and Spitzer space telescopes. The way Kipping, Sasselov and Spiegel’s model makes use of a graph that plots a planet’s mass against its radius, and where a world falls on that graph, tells us whether it is solid rock, partly watery or has a significant fraction of gas. "There’s a full range of models that we think a super-Earth can be built out of," Kipping said. "You can make them out of iron, or out of silicate, or out of water, or some mixture of those things." Kipping and his cohorts have calculated theoretical limits — boundary conditions — for each type of planet. The lower boundary condition denotes a super-Earth made of solid rock with an iron core and lacking an atmosphere. The top boundary signifies a planet made entirely of water that, Kipping said, is probably impossible — there needs to be a solid core in there somewhere — and thus you cannot get a super-Earth less dense than a water-world (purely gaseous planets, it is thought, cannot exist as small as super-Earths and even Neptune-type worlds have a large rocky core lurking inside them). Therefore, if you discover a planet and plot its mass against its radius only to discover that it resides on the graph above the impossible pure-water line, then the only way to explain its apparent density given its radius is that it must have a large atmosphere. Such mass-radius models have been around for a while, but what makes Kipping’s different is that they are based on a new understanding of the physics of materials placed under the enormous amounts of pressure that the interior of a super-Earth would impose on them. Dimitar Sasselov, along with his student Li Zeng, was able to create superior models of the interior of super-Earths using new laboratory technology that is able to simulate those pressures. They published their work in the March 2013 issue of the Publications of the Astronomical Society of the Pacific and Kipping’s mass-radius diagram, itself to be published in the Monthly Notices of the Royal Astronomical Society, is modeled around those interior structures derived by Sasselov and Zeng. What does the model tell us about super-Earths we have already discovered? Kipping, Spiegel and Sasselov concentrated on GJ 1214b, a world with six and a half times the mass and two and a half times the diameter of our planet that is orbiting a red dwarf star 47 light years away. Prior to now the planet had been a puzzle — no matter what wavelength it was observed in, the size of the planet was always the same, which shouldn’t happen because an atmosphere should be more opaque to some wavelengths than others. Was its atmosphere extended and topped with thick, opaque clouds, or was its atmosphere thin enough not to be noticed? Employing the mass–radius diagram settles the matter. "Our method says that 20 percent of this planet’s radius is pure atmosphere, which strongly favors the idea of a very light, extended hydrogen-helium atmosphere with clouds on top," Kipping said. "So we are able to come into this discussion with these two possibilities and say which is more likely, just based on the simple measurement of the mass and the radius of the planet." "We tried to apply our technique to this planet but unfortunately the mass measurement is very poor because it is a very distant star," Kipping said. "What we found was that the data was unable to say one way or another what kind of planet it is; it sits right on the blue [water-world] line, so we can’t tell whether it is a rocky planet with an extended atmosphere or a water-world with very little atmosphere." Unfortunately that’s also the story for the rest of the potentially habitable planets discovered so far, a list of which is maintained by Professor Abel Mendez of the Planetary Habitability Laboratory at the University of Puerto Rico at Arecibo, in the form of the Habitable Exoplanets Catalog. One dozen planets currently reside on the list, meeting the criteria of being (probably) rocky and existing within their star’s habitable zone. However, as we found with Kepler-22b, in most cases either the mass or the radius is little more than an estimate, and as such the majority tend to sit on that boundary condition. "Astronomers estimate mass or radius from the assumption that smaller planets are more rocky in composition and those larger planets close to two Earth radii are water-worlds," Mendez said. "This seems to be a good estimate for most cases but there is a lot of uncertainty; for example, Kepler-11f has just over two Earth masses but it is a gas planet, while Kepler-20b with about nine Earth masses is rocky." Kipping’s mass–radius diagram is only half the job. Without good data the new mass-radius relationship is limited in what it can tell us. For Kepler planets, better mass measurements from radial velocities are required, but this is tricky given that most of the stars around which Kepler discovers planets are faint and distant. For those worlds discovered by radial velocity, we need more luck in observing transits to give us their diameter. The approval of the Transiting Exoplanet Survey Satellite (TESS), which is scheduled to launch in 2017 and will systematically survey all the brightest stars in the sky for transiting planets, will be a massive boon to the field. "The TESS mission promises to dramatically change this picture," said Heather Knutson, a planetary astronomer at the California Institute of Technology whose research is focused in the area of exoplanet atmospheres. "At the moment there are currently only three transiting super-Earths that are suitable for detailed characterization and all three have been observed with either the Spitzer or Hubble space telescopes, or both. In the era of TESS we will have far more super-Earths than we can reasonably study and Kipping’s criterion will provide a useful means to select targets that are likely to have detectable atmospheric signatures." "At this point almost anything is possible!" Knutson said. Cutaway diagram of gas giant Jupiter’s atmosphere and core, compared to Earth’s. There are many factors that go into making a planet habitable, from the presence of a magnetic field to protect its atmosphere to the question of whether it has plate tectonics to recycle carbon. A stable rotational axis, a moderate impact rate and sufficient gravity are also plausible necessities. Yet, the possession of an atmosphere, especially one that contains some form of greenhouse gas, is one of the most crucial factors, essential for maintaining cozily warm temperatures that permit all-important liquid water to exist on its surface. That said, the range of suitable atmospheres may not be as narrow as we may think. "I don’t think that thick hydrogen–helium atmospheres will rule out the potential for life on these planets as long as the pressure at the surface/water transition allows for liquid water," Mendez said. So a super-Earth, with a thick envelope of hydrogen swathing a rocky core deep down could still have watery conditions at depths where the pressure, according to Mendez, drops below 10,000 atmospheres, although of course temperature will also have a say where and if this transition point occurs. There is one more intriguing possibility. On Earth, convection currents and air flows are strongly influenced by what is on the surface, be it oceans, continents or mountains. Could a careful study of the atmosphere of a super-Earth tell us things about the terrain below that are otherwise beyond the capabilities of our telescopes? "Yes, potentially, but the atmosphere would need to be thin enough for our observations to detect the atmosphere flows from the region close to the surface," said Knutson, who also points out that a thin atmosphere will be transparent enough for us to spectroscopically measure the surface of the planet and determine whether there are oceans, desert or even plant life. "When we get these new super telescopes in the future [such as the Thirty Meter Telescope, the Giant Magellan Telescope and the European Extremely Large Telescope] we’ll be able to go down to sort of Earth-like atmospheres," Kipping said. "In special cases we could probably go down to these very small atmospheres that are potentially life-harboring." "If you are really hunting Earth-like planets and our method tells you it has a big extended atmosphere, then you are probably wasting your time," Kipping said. "So it’s a way of making our searches for Earth-analogues more efficient." With TESS and JWST and the next generation of extremely large telescopes on the horizon, Kipping’s new model is timely indeed. The way things are going, the next decade might be the decade of the super-Earth. All the hints are it is going to be an exciting time.